Three times National Award Winner in Special Effects, Srinivas Mohan talks about his experience while working on Robot and what the future holds for the VFX industry in India. What makes a great VFX artist? The main aim of VFX is to make things believable. As artists, we take things that are impossible and make it realistic. In order to make things seem plausible, you need to have artistic talent. Also, you have to learn the concepts applied behind creating a VFX shot and not just how to operate the tools. A great VFX artist should have knowledge pertaining to the overall techniques required for making a film. It is essential that the artist is creative rather than merely a person who has been trained to use the tools. These days, most, if not all films have a VFX shot. People think of VFX as the force responsible for aliens, robots, or high-end action sequences etc. Can you give us an example of something at the other end of the spectrum, something simple, which would also constitute as a VFX shot? In the movie Robot, we have one person who played the role of a scientist as well as the robot. Almost every shot requires both the characters in the same frame. It is a simple shot but a lot of work goes behind creating such shots. Also, in Shivaji a technique referred to as skin crafting has been used. Although there is no action sequence, VFX is required for such techniques. There seems to be a lot of international criticism of Indian VFX, that the artists are trained technically but lack the artistic component? Do you agree? We do lack artistic talent. In the movie Robot, I worked in local as well as companies that were based outside India. If you compare, people abroad have a better understanding of the work that is given to them. For instance, if there is a shot that requires something to fall on the ground, the dust is generated automatically. People out there are aware about these simple things but that is not the case here. Every minor detail has to be mentioned here because people are accustomed to take orders and follow the instructions. They lack the creative talent that can be found outside. We need more schools from the government like the one in Ahemdabad that are dedicated to VFX. Although we do have private institutions, VFX as a whole is not taught. The students are being trained in only those aspects of VFX which are presently required here. There is a lot of work being outsourced to India and there are specific tasks which pertain to the work that flows inside our country. These institutes teach only the specific tasks and less or no priority is given to the overall aspect of VFX. What are some ways that this perception and/or reality can be changed? Presently, the industry is growing in different directions. A lot of work is outsourced to India. The growth may be somewhere around 20 to 30 per cent. But that is not what we should aim at. We don’t concentrate on creating content like what was done in the case of Hanuman. It is important that we grow in every aspect. We require good institutes which can boost local talent. India could have something like Pixar. Although everyone claims that the industry is growing fast, I beg to differ. We are growing but slowly. How do you think the VFX industry in India will look after 10 years? If the development continues at the same pace, we might not do well in the future. If however, with the support of government we could enhance the talent in our country, there will be tremendous progress. India has creative people and we are culturally very rich. In addition, we showcase hard working skills. So if we csontinue at the same rate, the future looks bleak. But if something is done to improve the conditions, we will definitely head for a brighter tomorrow. Robot was a milestone for the Indian VFX industry. You must be very proud of this accomplishment. Will India see more films like this in the coming years? Do you think the public demand for domestic VFX intense films is increasing? Yes definitely. After the success of Robot, almost 60 films in South India required high end VFX. This also indicates that our audience craves for such content. The Indian audience enjoys watching Hollywood movies which proves that the demand for high quality work has been increasing. I believe that even if the movie has one VFX shot, it should be done right. There is a lot of gossip about RA ONE having ripped off a VFX shot / scene from Robot…specifically, the train sequence. Any comments? Many movies require train shots and so I don’t think it is a rip off. I am not aware of any such rumour but even so, using a train sequence cannot be termed as any kind of rip off. Which was the most difficult shot for you to create in the film Robot? The toughest part of the movie was the climax scene where all the robots form different shapes. The entire process was quite taxing. Were there any VFX shots that got cut from the final film? In such movies there are no shots that get edited or don’t make it to the final cut because there is a lot of pre production work. At least this was the case with Robot. A major part of the movie was done in pre visualization. Some forty out of sixty scenes were animated, which means they were completed before we started actually shooting the movie. Each shot is very expensive and so you can’t really afford to shoot and reshoot. Everything in this movie was done in pre visualization which took about 6 months. How much liberty/control did you have during the pre production of the film? We did extensive pre production in this film and I had full freedom. The good thing about the director is that he has abundant knowledge related to visual effects. 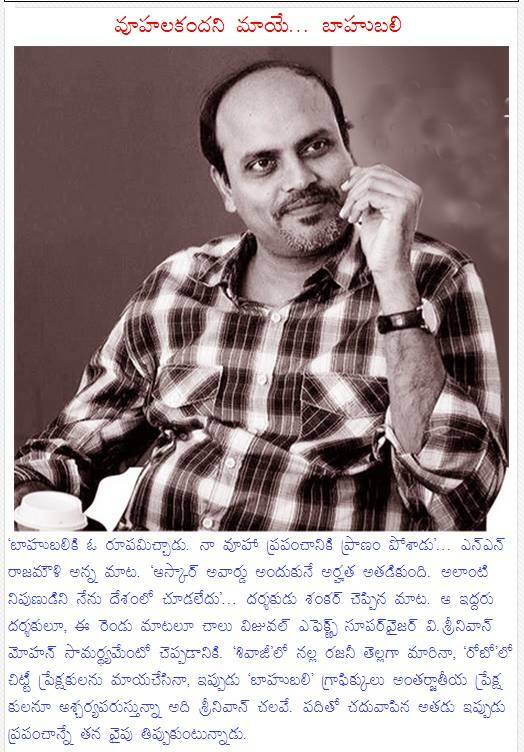 I can say that he is the guru of visual effects in India. From the nine movies that he has made till date, all of which required extensive visual effects, five films have won national awards. In movies with VFX, the script is locked and there are no changes. However, we were given freedom to make minor changes. For instance the character of Robot wears sunglasses throughout the film. We suggested this because while you are dealing with computer generated (CG) characters, getting the eyes right every time is a tough nut to crack and also very expensive. Therefore sunglasses were used. Also, if you look at the hair, which is again a little tricky to create, we suggested the use of short rigid hair. So as far as the character design was concerned, we had a lot of liberty. How much can we learn from all the international studios that have recently opened branches in India? We need to get the planning aspect right because that is one of the things that India lacks. Also we need good technology. Someone once told me that VFX could be so realistic these days that companies have to actually dial the ‘realism’ down. Is that true? For example…in the recent Hollywood summer blockbuster, The Rise of the Planet of the Apes, not a single real chimpanzee was used. Yet the facial expressions, gestures, etc are breathtaking. What if a human live action actor could be replaced by a CG one? Would people embrace it? Planet of the apes was an excellent movie. Many CG characters were created. It is a beautiful motion picture. If you look at the movie, The Curious Case of Benjamin Button, the makers have replaced the head of the protagonist but you can hardly point that out. So yes, VFX can make things very realistic but at the same time it is a costly affair. Even in Robot, there are a few completely CG shots but it wasn’t expensive as a robot has no expressions. But the future holds promise. For our industry, RA. One has been an epic and has acted as a stepping stone for others.